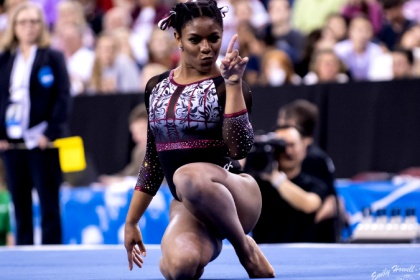 Two teams defended their titles and the Big Ten crowned a new champion as the conference championships concluded this weekend. See how each conference wrapped up and how each team is faring heading into the NCAA championships in just two short weeks. 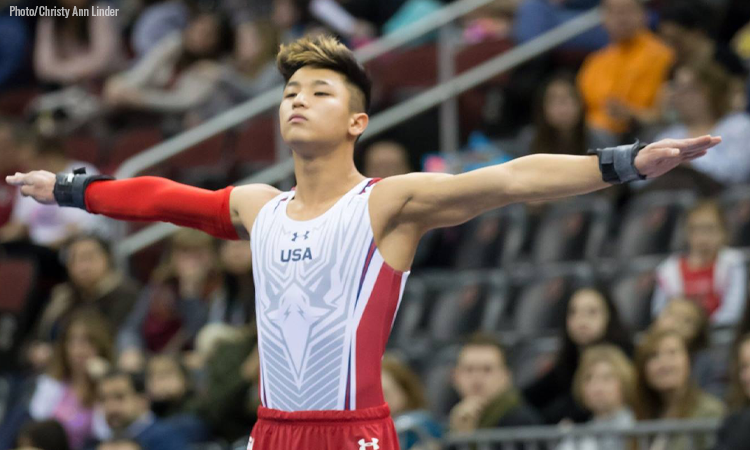 Anderson’s stuck Tsuk double back pike helped Oklahoma defend their MPSF team title and earn himself the vault title. The freshman had a breakout performance to take the Big Ten high bar title in his conference championship debut. The Midshipmen easily claimed the ECAC team title with their 10.5 point gap ahead of the second place team, the largest margin of victory of the weekend. The Big Storyline: Oklahoma started out its postseason strong by claiming the MPSF team title, all around title and five event titles. 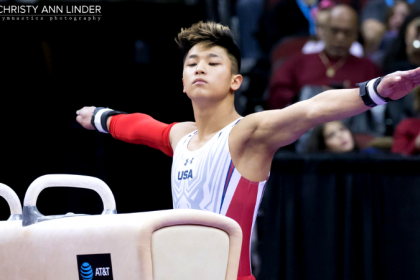 As expected, senior Yul Moldauer led the way for the Sooners, capturing the all around and three event titles along the way. The only non-Sooner to win an event title was Air Force’s Lukas Texeira, who won high bar—the only event where Oklahoma did not have a gymnast place in the top three. Stanford put pressure on Oklahoma the entire meet, falling by one of the smaller margins during Oklahoma’s four year undefeated streak. The Cardinal came away with no winners but had a handful of gymnasts finish as runners-up including freshman Brody Malone in the all around. Senior Aaron Mah led the way for California, placing fifth on floor for the Golden Bears’ best finish of the day. Implications: Oklahoma, Stanford and California will all qualify full teams to the NCAA championships. Air Force will not qualify a full team but will likely have several individuals. Records: This was Oklahoma’s eighth-straight MPSF team title. Moldauer now holds more conference titles than any other Sooner in history wilh 12 titles. 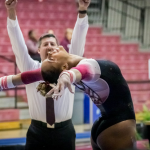 Texeira is the first gymnast from Air Force to win the MPSF high bar title. The Big Storyline: In a tightly contested meet, Penn State was able to edge defending champion Illinois to win the Big Ten team title. Heading into the final rotation, the Nittany Lions were down 2.9 points, but the highest rings rotation of the meet was the difference and won Penn State the title. The runner-up Illini still had two winners with senior Alex Diab claiming the rings title and freshman Hamish Carter winning high bar. Michigan was also in the mix to take the title but still left with Cameron Bock’s all around crown and Jacob Moore’s floor win. In the highly contested pommel horse event final, Ohio State’s Alec Yoder edged out Penn State’s Stephen Nedoroscik and Illinois’ Michael Paradise for the conference championship. Nebraska’s Anton Stephenson won vault, and Penn State’s Sam Zakutney won parallel bars to round out the Big Ten event titles. Iowa’s Andrew Herrador finished second on high bar to lead the Hawkeyes and Minnesota’s best finisher was Shane Wiskus who took third on parallel bars. Implications: All seven Big Ten teams will qualify for this month’s NCAA championships. Records: Diab finished his Big Ten championship career as a four-time Big Ten rings champion, and Stephenson won vault for the third time in his career. The Big Storyline: Defending champion Navy rolled to its second-straight ECAC team title while also picking up four event titles. The Midshipmen’s pommel horse rotation, capped by David Toussaint’s winning set, outscored the next best teams’ total by nearly six points and that event made up most of Navy’s 10.5-point margin of victory. Second place Army yielded the championship’s only double winner, Matt Davis, who picked up floor and parallel bars titles to lead the Black Knights. Rings specialist David Watkins shared the event title on the event for William & Mary’s lone title of the meet while Springfield’s only title came in the all around thanks to junior Stephen Lewis. UIC’s Sam Montague placed fifth in the all around and tied for seventh on floor as the Flames’ top performer. Implications: Navy and Army will both qualify as teams for the NCAA championships in two weeks. Records: Navy’s Toussaint, Lucas Beltran and Ben Provost all defended their event titles from last seasons’ championship.